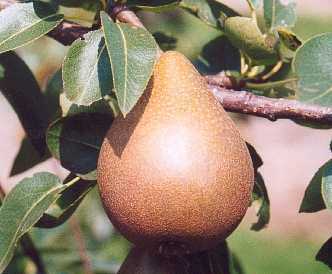 A heavy cropping pear with sweet juicy well flavoured fruit. Raised by Dr Van Mons in Belgium who named it after his granddaugter Julie. First fruited in 1842. Medium sized conical fruit. The green skin is rather thick and almost entirely covered with a rough brownish russet. The cream coloured flesh is tender, juicy and very sweet. Good, slightly perfumed flavour. Generally a heavy cropping variety.